Anthem is an online multiplayer action role-playing video game developed by BioWare and published by Electronic Arts. The game was released worldwide for Microsoft Windows, PlayStation 4 and Xbox One on February 22, 2019. Set on an unnamed planet, players assume the role of Freelancers, heroic adventurers who wear powerful exosuits to defend humanity from the threats beyond their cities' walls. The game's title refers to the Anthem of Creation, a powerful and mysterious force responsible for most of the extraordinary technology, phenomena, and threats in the world. In the main narrative, the player's Freelancer is tasked with stopping the villainous Monitor from seizing control of the Anthem. Anthem received mixed reviews from critics, who criticized it for its grind, technical aspects, and story, contributing to an experience that felt repetitive and shallow, although its combat, flight controls, and visuals received some praise. Anthem combines third-person shooter and action role-playing game elements in a "contiguous open world" shared with up to three other players. Each player takes the role of a Freelancer donning fully customizable exosuits called Javelins. Anthem features four unique Javelin variants which the player unlocks while progressing through the game. Each Javelin features unique attributes and abilities that encourage different styles of play and evoke classic RPG character archetypes. The Ranger is the Javelin all players begin the game with, and is considered the "all-around master of combat"; the Colossus is the largest, slowest, but most resilient Javelin, and features a large shield to absorb attacks or hit enemies; the Interceptor is the fastest and most agile Javelin, specializing in quick close-quarters melee strikes; and the Storm is the least armored Javelin, but can remain airborne the longest, allowing it to attack from a distance with blasts of elemental energies. Anthem is set on an unnamed planet littered with advanced technological relics that harness an omnipresent energy source known as The Anthem of Creation. Unstable relics can spontaneously terraform sections of the planet, mutate wildlife, change the local climate, create portals, and spawn monstrous creatures. Extremely unstable artifacts can envelope a significant area with destructive energies, storms, and creatures, rendering them barren and inhospitable. Such events are known as Cataclysms. Humanity has limited knowledge as to the origins of these relics, how they work, and the extent of their abilities, but believe they were created by a godlike race called the Shapers, who abandoned the planet thousands of years ago for unknown reasons. The Anthem and the Shapers are revered by some people as the source of all life. Centuries before the start of the game, humanity was enslaved by a race of creatures called the Urgoth. A human named Helena Tarsis and her compatriots used Shaper technology to invent powerful exosuits that would allow them to fight back. These exosuits became known as Javelins, and Tarsis sacrificed herself to overthrow the Urgoth, who haven't been seen since. Over the centuries, General Tarsis and her Legion of Dawn became heroic legends to humanity, which also reestablished itself as a dominant race. In the nation of Bastion, most people live in fortified cities protected by Sentinels: Javelin pilots who act as the primary security and police force within the city walls. National security issues that require discretion and espionage are handled by Corvus, Bastion's official intelligence and diplomatic agency. Beyond the cities is a frontier filled with dangerous creatures, exiled outlaws, a hostile insectoid race called Scars, and random disasters caused by unstable Shaper artifacts. Cities rely on Freelancers, a faction of altruistic Javelin-piloting mercenaries, to deal with these threats. In the field, Freelancers rely on the help of Cyphers, individuals who are naturally attuned to the Anthem and use their resulting psychic gifts to remotely assist on missions and process data. Ten years before the main campaign, an authoritarian faction called The Dominion attacked the city of Freemark, which was the Freelancers' primary base of operations. The Dominion wanted to access a Shaper relic beneath the city called the Cenotaph, believing it would grant them control over the Anthem. Their activation of the Cenotaph resulted in an explosion that annihilated Freemark and left an expanding Cataclysm in its place called the Heart of Rage. A famed Freelancer named Haluk rallies an army of Freelancers to enter the Heart of Rage and deactivate the Cenotaph. Among them is the player's unnamed character, a rookie undertaking their first mission. Accompanying them is Faye, Haluk's own wife and Cypher. Shortly into the mission, all the other Freelancers are killed, prompting Faye to call a retreat, with the player evacuating a wounded Haluk. The resounding failure causes people to lose faith in the Freelancers, whose ranks are now decimated. Two years later, the player has settled in Fort Tarsis, a frontier city between The Heart of Rage and Antium, Bastion’s capital. Partnered with a young Cypher named Owen, they make a living completing modest Freelancer contracts for the locals. Owen aspires to be a Freelancer, despite his psychic abilities being a hindrance to piloting a Javelin. An agent of Corvus named Tassyn hires the player to locate a spy who went missing while undercover with a smuggling gang called the Regulators. At a devastated Regulator hideout, they encounter a Dominion leader called The Monitor. The Monitor is a powerful Cypher, a skilled Javelin pilot, and participated in the assault on Freemark that created the Heart of Rage. The Monitor executes Tassyn's spy and takes a Shaper relic that they were hiding. Tassyn surmises that The Dominion is collecting relics for another attempt to reach the Cenotaph, and rehires the player to reach the Cenotaph first. She also notes that Haluk and Faye have spent the past two years developing a new plan to deactivate the Cenotaph, recruiting the pair to Tassyn's mission. Faye and Haluk believe that the only Javelin able to survive the Heart of Rage is General Tarsis’s legendary Javelin of Dawn. Using clues found in the tombs of Tarsis’s Legionnaires, they locate Tarsis’s secret tomb. Within her tomb, the player's obtains Taris's signet, which acts as a key to the Fortress of Dawn- the site of Tarsis's last stand and the Javelin of Dawn's resting place. At the Temple of Dawn, the player is challenged by trials of skill and resolve. After reenacting Tarsis’s last stand, an apparition of General Tarsis declares the player to possess the qualities of a Legionnaire of Dawn and grants access to her Javelin. Before the player can take possession of the Javelin of Dawn, their own Javelin freezes up. Owen appears and takes credit for sabotaging their Javelin so he can take the Javelin of Dawn for himself. He plans to accept The Monitor's offer to spare Fort Tarsis in exchange for assisting him with the Javelin of Dawn, and accuses the player of keeping him from his dream to be a Freelancer. Before Owen leaves in the Javelin of Dawn, Faye scans its unique shielding module, the Shield of Dawn, hoping that it can be duplicated so the player can enter the Heart of Rage with their own Javelin. Haluk and Faye succeed in building a copy of the Shield of Dawn, but are unable to activate it. At the same time, Tassyn arrives to announce that The Dominion are nearing the Heart of Rage. Tassyn also reveals that she hired the player at Faye's own request in order to replace Haluk's role as a Javelin pilot. Upset, Haluk flies his Javelin to the Fortress of Dawn to find a way to activate the Shield of Dawn, but is ambushed by The Dominion. The player arrives to find that Haluk was saved by Owen, who apologizes for his betrayal. As a peace offering, Owen gives up his own Shield of Dawn before leaving. After activating the Shield of Dawn on their Javelin, the player returns to the Heart of Rage, with Faye and Haluk providing remote support. The player discovers that The Monitor has used the conduit to merge with the Anthem, and is forced to fight him. After The Monitor dies, Faye uses her powers to deactivate the Cenotaph and close the Heart of Rage. While celebrating in Fort Tarsis, the player is pulled away by Tassyn to see the corpse of a Urgoth recently discovered and killed inside of Bastion's borders. Suspecting another crisis, the player is asked to be ready to help again. Development of the game started in 2012, immediately after the release of Mass Effect 3, under the supervision of Casey Hudson, the executive producer of the original Mass Effect trilogy. Internally, the project was codenamed "Dylan" internally by BioWare, in reference to Bob Dylan in hopes that it would be a name that would be spoken about years later. The working title, up through 2017, was Beyond. While BioWare did not have any strong ideas at the start of Anthem's development cycle, they knew they wanted an action game that players could play cooperatively, and which moved away from their Mass Effect and Dragon Age franchises. An early idea that focused the direction was the use robotic-enhanced exosuits, akin to Iron Man's, to be able to survive on a planet that acted as a Bermuda triangle that drew in all types of hazards and dangerous creatures to it, with the players having to survive these. It was initially started to be a kind of mission-driven survival game rather than a loot shooter: players would team up with friends, go onto missions fighting their way to and from the site, collecting resources to upgrade their suits, all while behind the scenes, BioWare could pull various world event triggers to keep players surprised and alert to these events. The idea was that players after completing these missions would be able to share their stories with others. This was the state of the game as it was presented during EA's Electronic Entertainment Expo 2014 event. A primary concern at the early stage was scaling-up the concept in gameplay, art, and technical feasibility within the Frostbite engine. Around August 2014, Hudson believed the team at BioWare Edmonton was in a sufficiently good place to continue without his oversight, and left BioWare. Some inside the Anthem team were concerned, as Hudson's leadership on past games kept their team on point, in contrast to the current development efforts on both Dragon Age: Inquisition and Mass Effect: Andromedia's teams. After Hudson's departure, the team started to struggle on the scaling aspects that impacted other parts of the development. In early 2015, Dragon Age's writer David Gaider was assigned to the Anthem team to help with its story. Gaider drew the story back towards something more in common with Mass Effect and Dragon Age, rather than pull away from those series. The narrative shifts put further strain on the artists and level designers to match with the story's direct. Gaider left BioWare in early 2016, and the story was brought back towards what the team had originally envisioned. Furthermore, the team continued to struggle with the Frostbite engine, as EA's management under Patrick Söderlund wanted all its studios using the same technology. Frostbite was not originally designed for the purposes that they had in mind for Anthem, and BioWare had difficulty transitioning some of the systems they had built for Dragon Age and Mass Effect into Anthem. leading to the team scrapping some of their gameplay concepts like survival and crafting. Some of the BioWare team familiar with Frostbite were moved to support the FIFA series in 2016 when it transitioned to the Frostbite Engine, leaving fewer to help with Anthem. Four years into development, developers expressed concern that Anthem was nowhere close to the final production stages, and were facing similar issues with poor management of the project as had happened with Dragon Age: Inquisition and Mass Effect Andromeda, as few concrete decisions were being made by the lead designers. Despite trying to distance themsselves from Bungie's Destiny, elements from that game, particularly related to the loot shooting aspects, started to seep into Anthem's gameplay as BioWare recognized that Bungie had greatly refined these elements. Moving from 2016 to 2017, several events forced many of the decisions in Anthem's final design. As part of a holiday transition in BioWare, one team provided the entire staff with a demo of their current project to play and test over the Christmas holidays, and 2016 was Anthem's turn. The Christmas demo had reached Söderlund by early 2017, and expressed great concern with its state in contrast to the previous 2014 teaser, and ordered several senior members to fly to Stockholm, Sweden and discuss how to improve the game with EA DICE, the creators of the Frostbite engine. Söderlund then told BioWare to create a new demo in anticipation of E3, which BioWare considered would be the end of the game if the demo did not impress Söderlund. BioWare spent six weeks to produce the best looking demo to show Söderlund when he was to visit the studio in 2017 prior to E3; to put their best work forward, they readded the flying aspect that had been added and removed several times over the course of development. Söderlund was impressed with the demo, particularly the flying, and this would serve as the basis for the game's reveal at E3 2017. Just prior to E3, EA notified BioWare that their desired name for the game, Beyond, would be too difficult to trademark, and BioWare chose Anthem, one of their backup names. Separately, Mass Effect Andromeda shipped: the BioWare Austin offices shifted from that to help with Anthem, while EA shuttered the Montreal offices. Andromeda had several problems at launch, drawing BioWare staff to resolve these issues, and was not as successful, putting more pressure on the quality of Anthem. Even after resolving Andromeda, there was tension between the Edmonton and Austin teams, in part due to the lack of concrete decisions on gameplay elements. Around mid-2017, several BioWare staff departed the studio, and one of the lead gameplay designers Corey Gaspur suddenly died. The game was to have transitioned from pre-production to production around June 2017, but as late as August reminded behind schedule. BioWare knew they would miss the expected Q4 2018 release, and EA refused to allow the game to be delayed past March 2019. Around October 2017, Hudson returned as both the project lead and the new studio head. BioWare staff that had been working on a fourth Dragon Age game were moved to Anthem, including Mark Darrah in place as the game's executive producer. Darrah took control, focusing the team on releasing Anthem by EA's deadline, and firming decisions on elements of the game. BioWare developers, speaking anonymously with Kotaku stated that most of Anthem was effectively developed in the year prior to release due to Darrah's leadership and pressure from EA. Because elements of the game were changing quickly, factors like game balance and narrative cohesion were difficult to address before launch. This further stressed the staff at BioWare, and there were a large number of departures from the studio across 2017 and 2018. Drew Karpyshyn worked on the game's writing before leaving in early 2018. Bioware announced Sarah Schachner as Anthem's composer on August 20, 2018. Several tracks feature vocalizations by Schachner processed through a vocoder and MIDI controller. "Legion of Dawn", the song featured on Anthem's main menu, was performed by a live orchestra during 2018's The Game Awards. Anthem-Original Soundtrack was released on digital music services by Lakeshore Records and EA Games on February 22, 2018. On June 10, 2017, Anthem was formally announced with a cinematic reveal trailer, during EA's EA Play pre-E3 press conference. The following day, June 11, 2017, a six-minute gameplay trailer premiered during Microsoft's E3 press conference, running on Xbox One X. At E3 2017, when the game was announced, its intended release date was Q4 2018, but was pushed back in January 2018 to early 2019, in part to make space on EA's release schedule for a new Battlefield title in late 2018 release. According to Patrick Söderlund, EA's vice president, BioWare plans to support the game with new content and updates long after the game's official release, and that its launch will be "the start of maybe a 10-year journey" for BioWare. A demo of the game was released for download on January 25, 2019 for pre-order customers, and on February 1 for the public. On February 14, 2019, a live-action short film/trailer called Conviction was released online, depicting a story which takes place before the game. The film was directed by Neill Blomkamp and produced by his independent Oats Studio. 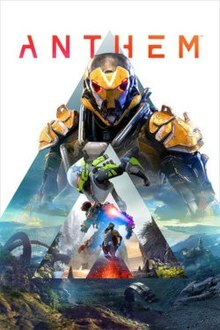 Anthem was officially released worldwide on all platforms on February 22, 2019. For Russian marketing campaign Electronics Arts and Russian consumer electronic retail chain M.video created commercial voiced by television host and naturalist Nikolay Drozdov and imitated television program In the World of Animals. Anthem received "mixed or average reviews", according to review aggregator Metacritic. Reviewer Kallie Plagge from GameSpot awarded the game a 6 out of 10, saying that "Anthem has good ideas, but it struggles significantly with the execution". IGN’s James Duggan scored Anthem a 6.5 out of 10, saying that "Anthem has energetic combat but it saves too much of what precious little content it has for the endgame, making playing through its mismatched story a tediously repetitive grind". Sam Loveridge from GamesRadar+, was more critical of the game. Scoring it a 2.5 out of 5, Loveridge stated that "Anthem is ultimately severely flawed, and very unfinished. There's half a good game in there, but it doesn't do enough to diminish the overall feeling of emptiness and repetition". Mike Williams from USgamer called the game a "frustrating experience", feeling that, aside from being tedious, the game lacked purpose and "ultimately doesn't feel like the best BioWare can do". PC Gamer gave Anthem a score of 55/100, saying that "Anthem's disjointed story, boring loot, repetitive missions, and shallow endgame are all disappointing. At least it's pretty". EGM's Nick Plessas was more generous toward the game. Awarding it a 7.5 out of 10, he stated "Anthem is a beautiful car that is an absolute joy to drive...", despite saying that "...the wheels will periodically fall off". Destructoid’s Chris Carter called the game a "fun experience" despite "some hard-to ignore faults". In spite of the mixed reception, Anthem received praise for its combat and flight. GameSpot described the flight as "freeing, serene and exhilarating all at once", despite being disappointed that the player will be "frequently forced to land or stay on the ground". USgamer was also fond of the flying experience, stating "Flying through massive tunnels, through monuments to the old civilizations, or simply through the trees of a forest is awe-inspiring". When mentioning the combat, IGN said that "Anthem's combat is initially strong, engaging, and unique, thanks in part to responsive flight controls that feel good on both controller and mouse and keyboard". Several critics noted extremely long loading screens that could take up to 5 minutes or longer and could even surpass the time necessary to complete an average in-game mission. The loading times were later improved as part of the game's day-one patch, among other improvements. Anthem topped retail sales charts in the UK during its first week of release. Its total launch week retail sales matched half of those of BioWare's previous game Mass Effect: Andromeda. Digital sales figures from EA Origin have not been released. Although retail sales are dropping across the industry in favor of digital sales, Eurogamer does not believe Bioware was able to make up the gap with digital sales. In Japan, Anthem reached the top of the sales charts with 78,000 copies sold at launch. In North America, according to NPD data tracking, “Anthem represents the second-highest launch month sales ever recorded for a BioWare developed game, trailing only the March 2012 release of Mass Effect 3" (these figures do not include digital PC copies). Anthem was at the top of PS4 downloaded video games via PlayStation Store by March 2019. SuperData reported that the game had earned over $100 million in digital revenue in February 2019, of which $3.5 million came from in-game purchases. In early March 2019, some players reported that their PlayStation 4 consoles had been shutting down while running Anthem, including claims that the game bricked their consoles. Electronic Arts has addressed and investigated this issue by asking players with the issue to share their crash data reports. ^ a b O'Connor, Alice (June 11, 2017). "Bioware's Anthem is an action-RPG shooter looking a fair bit like Destiny". Rock, Paper, Shotgun. Retrieved June 12, 2017. ^ a b c d Gilliam, Ryan (October 4, 2018). "Here's how Anthem's four character classes work". Polygon. Retrieved April 2, 2019. ^ Arts, Electronic (September 1, 2018). "The Four Javelins of Anthem". Electronic Arts Inc. Retrieved April 2, 2019. ^ Juba, Joe (June 9, 2018). "Anthem Does Not Have Romances". Game Informer. Retrieved June 10, 2018. ^ "Anthem: Our world, my story". GameGator. Retrieved September 2, 2018. ^ a b c Miller, Matt. "Everything You Need To Know About The World Of Anthem". Game Informer. Retrieved February 23, 2019. ^ a b Schreier, Jason (June 10, 2017). "BioWare Announces New IP, Anthem". Kotaku. Retrieved July 29, 2018. ^ Grubb, Jeff (June 10, 2017). "BioWare reveals its Destiny-like project Dylan, now called Anthem". VentureBeat. Retrieved July 29, 2018. ^ a b c d e f g h i j k l m n o p q r s t Schreier, Jason (April 2, 2019). "How BioWare's Anthem Went Wrong". Kotaku. Retrieved April 2, 2019. ^ Hudson, Author-Casey (July 18, 2017). "Coming Home". BioWare Blog. Retrieved July 29, 2018. ^ "Mass Effect 1, 2 and KOTOR writer is working on Anthem, Bioware's new IP". Neowin. Retrieved June 14, 2017. ^ "New World, New Score: Announcing Sarah Schachner as Anthem's Composer". blog.bioware.com. BioWare. Retrieved August 23, 2018. ^ a b "Music For Saving The World: Sarah Schachner And The Soundtrack Of Video Games". Junkee. March 19, 2019. Retrieved April 2, 2019. ^ Staff, Film Music Daily (February 14, 2019). "EXCLUSIVE! Preview The Anthem Game Soundtrack, Score By Sarah Schachner". Film Music Daily. Retrieved April 2, 2019. ^ Dyer, Mitch (June 9, 2014). "E3 2014: MASS EFFECT DEVELOPER BIOWARE TEASES NEW IP". IGN. Retrieved June 12, 2017. ^ "E3 2017: BioWare Reveals New Project, Anthem". IGN. Retrieved June 12, 2017. ^ "E3 2017: BioWare's Anthem Confirmed For PS4, Xbox One, PC; Release Date Set For 2018". GameSpot. Retrieved June 12, 2017. ^ Schreier, Jason (January 30, 2018). "BioWare's Anthem Officially Delayed To 2019". Kotaku. Retrieved January 30, 2018. ^ Purchese, Robert (June 20, 2017). "Anthem coincidentally the start of "a 10-year journey" for EA and BioWare". Eurogamer. Retrieved June 22, 2017. ^ Fingas, Jon (December 8, 2018). "'Anthem' demo will be open to everyone on February 1st". Engaget. Retrieved December 9, 2018. ^ "Anthem Conviction". ea.com. EA. Retrieved February 23, 2019. ^ Messner, Steven (February 15, 2019). "Anthem is now live on EA Origin Access Premier". PC Gamer. Retrieved February 25, 2019. ^ Loveridge 2019-02-15T13:00:57ZNews, Sam. "When does Anthem come out? It's a complicated answer, but here are all the details". gamesradar. Retrieved April 3, 2019. ^ a b Carter, Chris (February 19, 2019). "Anthem". Destructoid. Retrieved February 23, 2019. ^ a b c Plagge, Kallie (February 22, 2019). "Anthem Review: Flying Solo". GameSpot. Retrieved February 23, 2019. ^ a b Loveridge, Sam. "Anthem review: "Empty, utterly frustrating, and genuinely makes me sad"". GamesRadar+. Retrieved February 22, 2019. ^ a b c Duggan, James (February 21, 2019). "Anthem Review". IGN. Retrieved February 23, 2019. ^ Messner, Steven (February 21, 2019). "Anthem review". PC Gamer. Retrieved February 23, 2019. ^ Williams, Mike (February 22, 2019). "Anthem Review". USGamer. Retrieved February 23, 2019. ^ a b "Anthem for PC Reviews". Metacritic. Retrieved March 28, 2019. ^ a b "Anthem for PlayStation 4 Reviews". Metacritic. Retrieved March 5, 2019. ^ a b "Anthem for Xbox One Reviews". Metacritic. Retrieved February 27, 2019. ^ Square, Push (February 23, 2019). "Soapbox: ANTHEM's Load Screens are Killing the Game for Me". Push Square. Retrieved February 24, 2019. ^ Schreier, Jason. "Anthem's Loading Times Are A Real Problem". Kotaku. Retrieved February 24, 2019. ^ Tassi, Paul. "Anthem's 'Day Zero' Patch Does Improve Load Times, But New Problems Emerge". Forbes. Retrieved February 24, 2019. ^ Vargas, Joe. Anthem Angry Review. Event occurs at 3:25. ^ Gilliam, Ryan. "Anthem day-one patch addresses load times, updates Javelin abilites [sic]". Polygon. Retrieved March 5, 2019. ^ Philips, Tom (February 25, 2019). "Anthem's physical sales half Mass Effect Andromeda's". Eurogamer. Retrieved February 25, 2019. ^ "Japanese Sales Charts: ANTHEM Flies into First Place on PS4". Push Square. February 27, 2019. Retrieved March 3, 2019. ^ Grubb, Jeff. "February 2019 NPD: Anthem and Jump Force top software sales." Venture Beat. March 19, 2019. ^ "PlayStation Store: February's Top Downloads". PlayStation Blog. March 8, 2019. Retrieved March 9, 2019. ^ Worldwide digital games market: February 2019. SuperData. March 21, 2019.